Step 2: Open visual studio code and create project folder like (SweetAlertDemo). In this project folder we have create one sub-folder for project related files because so many files we need to create web application. In project folder we have create one scripts folder and in script folder create one module (.js) file. When create web application using angularjs, we must create module file in the project. This module file is important in the angularjs application. A module is a collection of services, directives, filters, and configuration information. Step 3: In the modular we need to inject component like above oitozero.ngSweetAlert”. Modular file is created then create controller file. The controller is attached with .html file if bind data in UI side (.html) you can bind data from controller and the controller call to service for getting data from server.You can create more than one controller in one controller (.js) file. In controller you can inject component like SweetAlert.We have created SweetAlertController.js controller file. Step 5: Two files are created, that one is module (app.js) and second is controller (sweetAlertController). Now, install the bower component from bower site or using nuget-package manager in visual studio. First of all download the (angular.js) file, this file is most important in angular web application you must inject this file in main page. Step 6: Second is angular-sweetalert and sweetalert component. This component is required for this example. 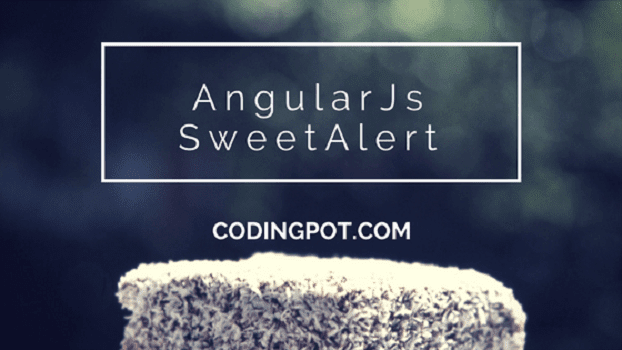 For show alert message you can use angular-sweetAlert and sweetAlert component. The entire Js file created or downloaded then now we create (.html) page their us can display our data. Step 7: You can see above, we have injected the modular (data-ng-app=”SweetAlert”).It is most important to inject module file in html page (main page).you can create more than one module file in project. Second is controller injected (data-ng-controller=”sweetAlertController”) in body tag. The modular and controller is injected then now inject component file like (angular.js, SweetAlert.js, sweetalert.min.js and css file sweetalert.css, app.js and sweetAlertController.js) files. Step 8: In above .html file we have injected bootstrap files for the better user interface. For better interface we have inject .css file and .js file like (bootstrap.min.css and bootstrap.js). From controller we have declare some static data for binding in .html page. This declared data we will show on Html (UI) side with bootstrap classes or css. So it's looked very attractive. Step 9: Now, above data will display on sweetAlert.html page. 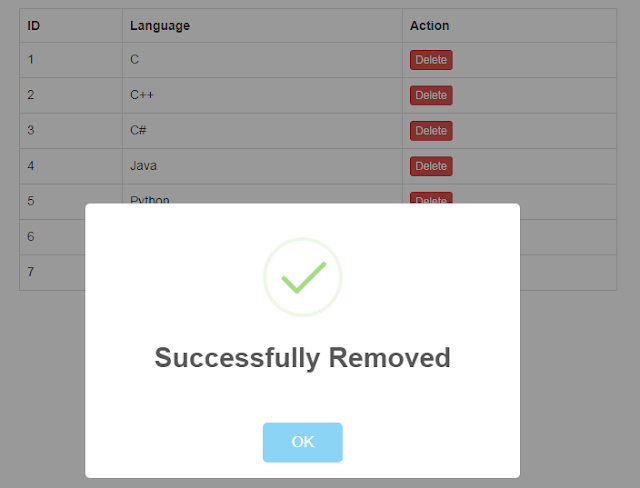 In .html page we binding data and their we provide delete functionality to delete binded data. The data bind from .html page with bootstrap classes for better user interface. When user try to delete then we notify to user you are confirm to delete this data. tag we have use data-ng-repeat to bind one by one data in new row with delete option. Run the application, You can see output. Below output, you can see data bind in table format using bootstrap with delete option. Now, we will see SweetAlert message when click on the delete button. When click on delete button we get confirmation from the user. Step 11: This confirmation dialog is part of the SweetAlert component. Will see confirmation dialog when click on delete button. In confirmation dialog two options are available Yes and No. If you click on “No, cancel!” button then confirmation dialog is close without any delete action. 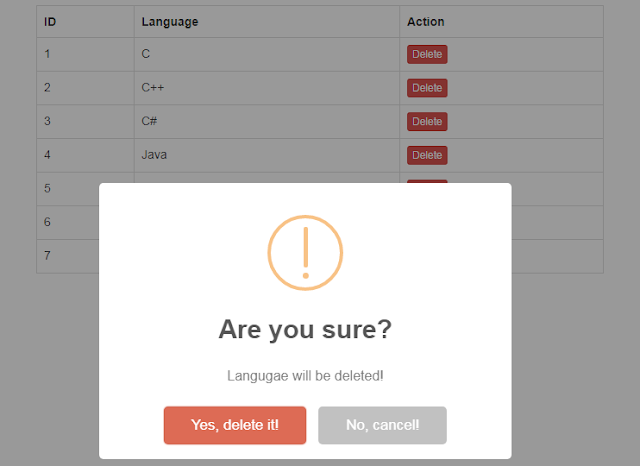 If you click on “Yes, delete it” then delete that row data as you code. Step 12: After successfully deleted raw data, we show the successful message to the user using SweetAlert. If any error occurred then you can show error message, you have set the type is error and set title of “Something wrong” message or your custom message. Click on the “Yes delete it” option, and then show successful deleted raw data message with right symbol. You can see successful alert message using SweetAlert in above figure. You can use so different alert message in your angularjs application with angular bower component. Click on “Ok” button and close the SweetAlert message box.